The judge did not find that Kimberlin Unmasked had, in fact, defamed The Dread Pirate Kimberlin. His ruling only went to the whether or not TDPK has a sufficiently strong case that he should be allowed to serve his complaint on Kimberlin Unmasked. In order for Kimberlin Unmasked to be adjudicated a defamer, Brett Kimberlin will have to win his lawsuit. The Cabin Boy, OTOH, has been adjudged to be a harasser. That was part of the process for the peace order issued against him. That had to be proved to a “clear and convincing evidence” standard which is a higher standard than the “preponderance of the evidence” required in a civil suit. Hold it. Schmalfeldt’s harassment of me has already been proved to a higher standard that required for a civil suit. IANAL, but I think that means if I were to sue him for harassing me, he’d probably be estopped from any defense, I’d get a summary judgment, and the only thing to be tried would be the amount of damages. This entry was posted in Blogging, Crime, First Amendment, Lawfare, Team Kimberlin, Trolls and tagged Brett Kimberlin, Cabin Boy Bill Schmalfeldt, Defamation, Dread Pirate Kimberlin, Harassment by wjjhoge. Bookmark the permalink. It is an extraordinarily stupid claim. 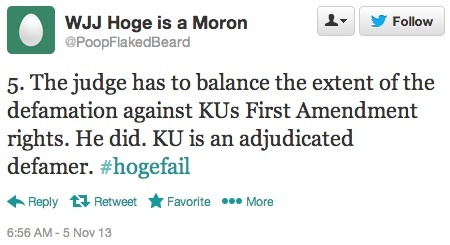 The judge can’t rule on the merits when KU has not even filed an answer, nor been served. But its the kind of flaming stupidity we’ve come to expect from Cabin Boy. Nor, is it correct to say, “The judge ruled on whether or TDPK has a sufficiently strong case.” The judge ruled on whether or not if he assumed everything TDPK wrote in the complaint were true it was sufficiently strong. The judge offered no opinion on whether or not his claims actually were true. Nor, did he consider any possible defenses citing either additional facts or law. Those would be for a trial. CBBS continues to shoot himself in the foot. Remember, he claims to have no part in the suits or their outcome. Except, he is stalking Ali, calling him names, stalking his family and friend, and trying to assist process servers. All on behalf of his good friend, BK. If and when the fun begins, he will be named as a party. The writing is on the wall. Question: is he a satanist? Just asking because he asks whether Ali’s Asian friend is a communist. You know, with no facts whatsoever.